Easter Funfair | All the fun of the fair – all under one roof. All the fun of the fair - all under one roof. The Easter Funfair will be taking place from April 13th – 22nd at Manchester Central. Not only does this great city centre venue mean we are easily accessible from across the North West, but it also means we can host all our rides inside – no need to worry about those April showers here! There will be two sessions each day and your ticket includes unlimited goes on all the rides. As well as a whole host of rides you can also test your skills on a range of funfair games before tucking into some delicious food from one of our catering stalls. The perfect family day out this Easter! The Easter Funfair is being held at Manchester Central, an iconic venue in the heart of Manchester. It’s right in the centre of the UK and easy to reach via Manchester’s extensive multi-modal transport network. Do I need to print off my e-ticket? E-tickets can be printed at home or displayed on the screen of a phone/mobile device. Tickets for any session can be purchased subject to availability at our on-site Box Office from Saturday 13th April for £18 per person. However, due to the high demand for tickets, we advise you to book in advance online or over the phone to avoid disappointment. Do I need to pay for a baby? Can I change to a different date closer to the date? No, unfortunately once a ticket for a session has been purchased it cannot be changed. How many adults constitute a family ticket? A family ticket consists of either 2 adults and 2 children or 1 adult and 3 children. Is there a disabled carer’s discount? Yes. We welcome visitors with disability and are committed to providing all guests with a safe and enjoyable experience. As part of this commitment, full-paying disabled children are entitled to one free ticket for their carer/personal assistant. Free carer tickets can be booked by calling Ticketline on 0161 832 1111. How long we can stay for? Your ticket covers all rides and attractions during one Easter Funfair session (except for food/drink and games). Each session lasts three hours (starting at the time stated on your ticket). Doors will open 15min before the start of your session. What age is a 'child'? Guests aged under 14 years old are classed as children and will need to be accompanied by an adult aged 18 or above. Visitors aged 14 years old and above will need an adult ticket and can attend the event unaccompanied. Those under 3 years old go free but will still require a ticket. 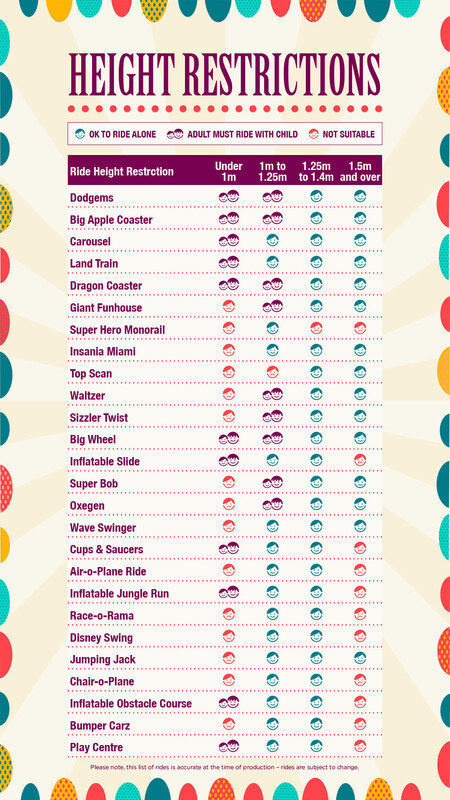 Your Easter Funfair ticket gives you unlimited access to ALL rides. Please note that food, drink and prize stalls are not included in the ticket price. Do you operate a ride pass scheme for children with disabilities and additional needs? The event is designed so that large queues are avoided and session numbers are capped to avoid overcrowding. Is the Easter Funfair only for children or can adults attend on their own? Whilst the event is aimed at families, adults can also attend on their own. Please contact Ticketline on 0161 832 1111 and they will be able to assist you. I have lost my phone with my booking email and ticket details? I haven't received my tickets? What postcode should I use on my sat nav? Can I reach the venue by public transport? Yes, as Manchester Central is based in the city centre, you can reach the venue using a range of public transport. We are just a few minutes’ walk from Oxford Road and Deansgate train stations and less than 15minutes from Piccadilly and Victoria Stations. The nearest Metrolink stop to Manchester Central is St Peter’s Square. From there, we’re just a few minutes on foot. There are also a number of buses that stop near to the venue. What security procedures will be in place at the event? There will be bag checks, on entry to the event. We therefore ask you to consider keeping bags and possessions to a minimum. Please also consider the size of your bag – we recommend just one small bag or handbag – to minimise the time it takes to search and gain access to the event. Do I need to allow extra time for security? The event doors will open 15 minutes before each session, it is recommended that you arrive ahead of your session start time to ensure there is time for security checks. Can I leave my child at the event? Children (under the age of 14 years old) must be accompanied by an adult 18 years or older. Will the event be affected by bad weather? No – as the fun fair is all indoors it will not be affected by adverse weather conditions. Do you have a baby change area? Yes there are baby changing facilities at the venue. Do you have first aid on site? First aid facilities are located in the main foyer. It is a good idea to bring some cash to spend at our games/food stalls. There is a cashpoint at the venue (chargeable). We are only able to permit registered assistance dogs to help disabled visitors. Whilst assistance/guide dogs are welcome they will not be able to accompany guests onto any of the rides. They will be allowed as far as the loading point where they must be left with a member of the party – they must never be left unattended anywhere in the venue. Can you take your own food and drink inside? The venue will provide a range of different food outlets so there will be something for everyone and there is no need to bring anything from home. However, we understand that due to various reasons some people will prefer to bring their own food. Please note there will be no baby food available at the venue. Please note there will be bag checks on entry to the venue, so we recommend you don’t bring more than one small bag or handbag – to minimise the time it takes to search and gain access to the event. Can you buy alcohol on site? A wide range of food and drink is available to purchase but alcohol not available and you cannot bring alcohol on site. Are there child sized portions and family friendly foods available? Yes, the food stalls will offer children sized meals and food suitable for small children. We welcome you to contact us for more information about this event.